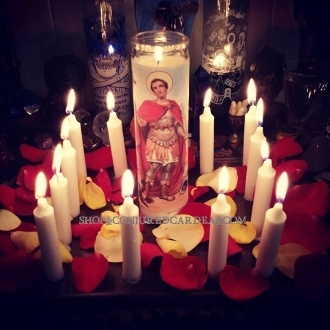 Saint Expedite's Feast Day is April 19th and I will be holding a service that day for my clients. This service includes one candle, dressed and prayed over for your specific request. Please leave your petition in the "special instructions" on your order upon checkout. YOU MAY PURCHASE MORE THAN ONE PETITION. You will receive 3-5 photos of the service. Please allow 72 hours to finish the service. Expedite is typically depicted as a young Roman centurion holding aloft a cross marked HODIE ("today" in Latin) and stepping on a crow beneath his right foot. Out of the dying crow's mouth issues a word-ribbon, CRAS ("tomorrow" in Latin). Thus Expedite destroys a vague tomorrow in favour of a definite today. There is a cute pun in what the crow says: CRAS CRAS CRAS is how Romans imitated the sound of crows (in English, this is CAW CAW CAW), thus crows and ravens are said to always be croaking about "tomorrow, tomorrow, tomorrow." Expedite, by stomping the crow, destroys the vice of procrastination (pro-CRAS-tination means putting things off until tomorrow).